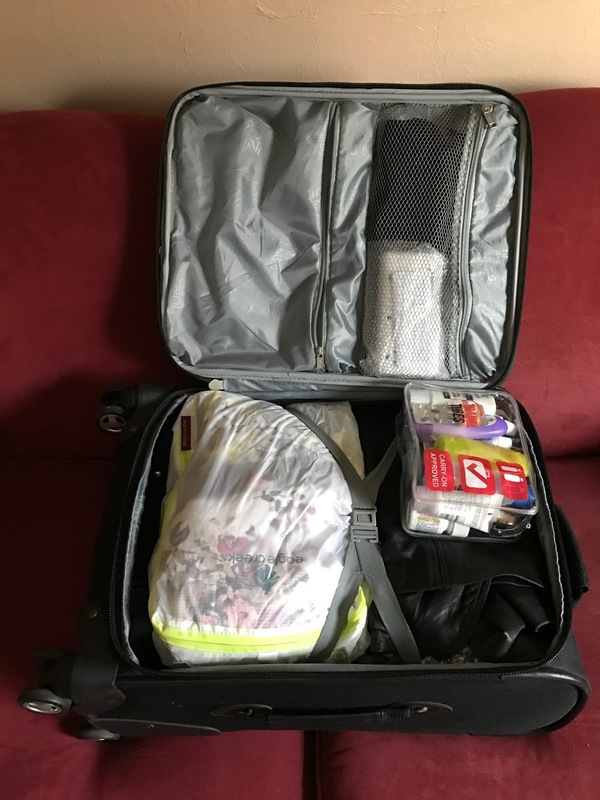 The first time I led a multi-country tour, I cringed at the suggestion to pack for twelve days in a single carryon. Is that even possible?! But the rationale was solid. What if your luggage is lost? By the time the airline locates the luggage, the tour has moved to a different city, and the chances of you reuniting with your suitcase is low. Since I believe in leading by example… I vowed to give it a try. The first thing to do is dismiss the idea of stylish dressing. By the third day, no one remembers what she wore the day before, much less what you were wearing. Keep it simple by wearing similar outfits each day. Next, always remember that comfort is more important than style, especially when it comes to shoes. Make sure you bring comfortable footwear as you will most likely walk in excess of 10,000 steps/day. I always pack two pair in case one gets wet. I quickly learned that a TSA approved plastic container for liquid products is well worth the money. While the common guideline is a quart sized bag… those purchased at the grocery store are severely lacking width. The TSA bags are truly 3-dimensional and provide ample space for a typical toiletry routine. However, if you use a lot of hair care product – consider packing enough for one or two days. Once you arrive at your first destination, plan a visit to the local pharmacy or beauty supply store to purchase full-sized product for the rest of the trip. At the end of the vacation, leave behind the half-empty bottles before heading home. When thinking about clothing, layers are key. My daily wear always consists of an undershirt, a top, and a jacket. I also carry an outer coat. Depending on when and where you are traveling, weather can span freezing temperatures in the morning to mid-60s by the afternoon. Since you will be away from the hotel until late at night, one outfit must accommodate all temperate zones. Since space is at a premium, a well-choreagraphed wardrobe is mandatory. I’ve been a proponent of the “capsule” wardrobe long before it was popular, meaning… every article of clothing matches. A few well-chosen pieces will allow you to create more than enough different outfit combinations for the two week tour. I personally gravitate toward neutral colors (black, brown, navy) and then accentuate with a pop of color (usually red). I am a big fan of scarves to quickly change the look of an outfit without taking up too much room or weight in the suitcase. When it comes to underwear, there are two schools of thought. One is to wash in the sink while on the go. If you choose this method, you need to think about laundry in advance. This will only work if you are in a city for longer than 24 hours, as you will need to allow for drying time. Be sure to rinse clothes the night you arrive, and they will be dry in time to pack before leaving town. 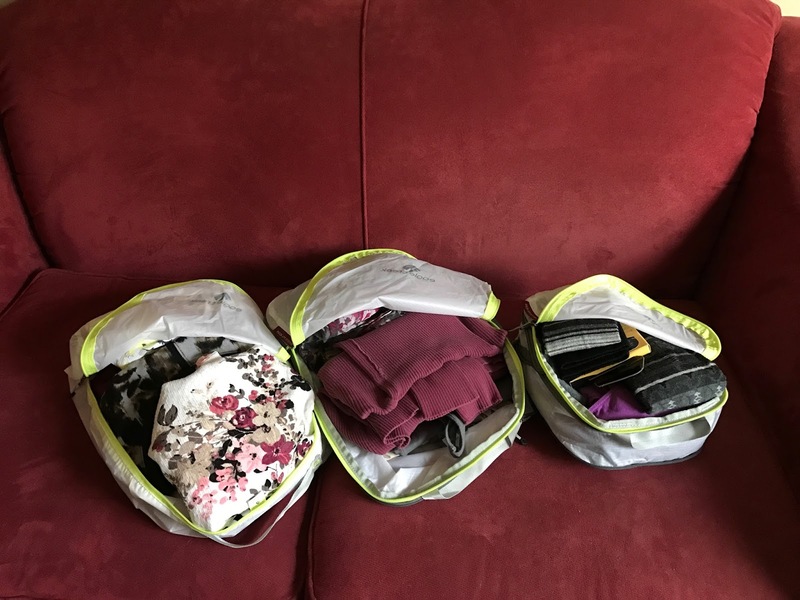 Another method is to pack old underclothes, such as t-shirts and underwear, and then leave behind (throw away) when worn. Obviously this does not require additional work or planning on your part, but more importantly, it does create additional space in the carryon for the inevitable souvenirs you want to bring back home. My plane outfit maximizes the layered clothing system. I wear my knee length boots to allow for more space in the suitcase. These boots pair with the dark wash jeans, and I then layer a cami with a turtleneck, add a scarf and complete with a brown leather jacket. These items I set aside before I begin packing. Next, I organize the remaining clothes. My husband gave me these lightweight packing cubes as a Christmas gift. While skeptical at first, I am now a confirmed believer. These things WORK! I used one bag for all my underwear, bras, and socks. Another bag for my tops and mock turtlenecks. And a third bag for my camis, ribbed turtlenecks and scarves. Not only do these bags conserve space, they act as a chest of drawers on the road. It will be easy to put things away at night, and assemble a new outfit in the morning. Once the cubes are filled, packing the suitcase is a breeze. First, I put the ankle boots on the bottom. 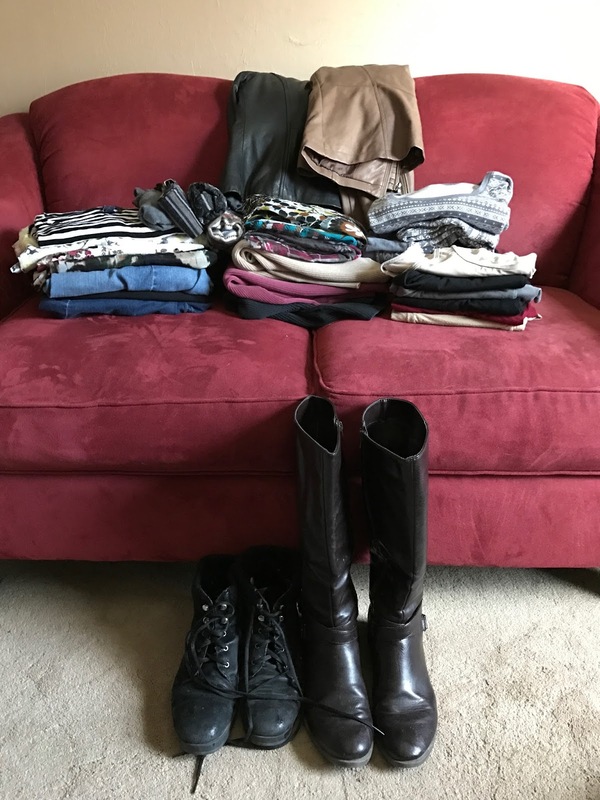 Next, I fold the two other pairs of pants and slip then next to the boots. A perfect fit. The three packing cubes fit nicely in the upper two-thirds of the suitcase, leaving space at the top for my folded leather jacket. I found a small space to stuff my pajamas for easy access that first night, when jet lag will claim all brain cells. I place the toiletries bag at the top of the suitcase, which will allow me quick access when checking in at the airport. The two inside pockets at the top of the suitcase are perfect for electric converters and assorted hair products. While the bag is full, it is by no means stuffed. This means I have room to buy a few souvenirs. YAY! This is the fourth article in my Leading a Student Group Tour to Europe series. Next week, I will briefly describe how I pack my “personal” item… and what I take with me on daily tours. This is smart. 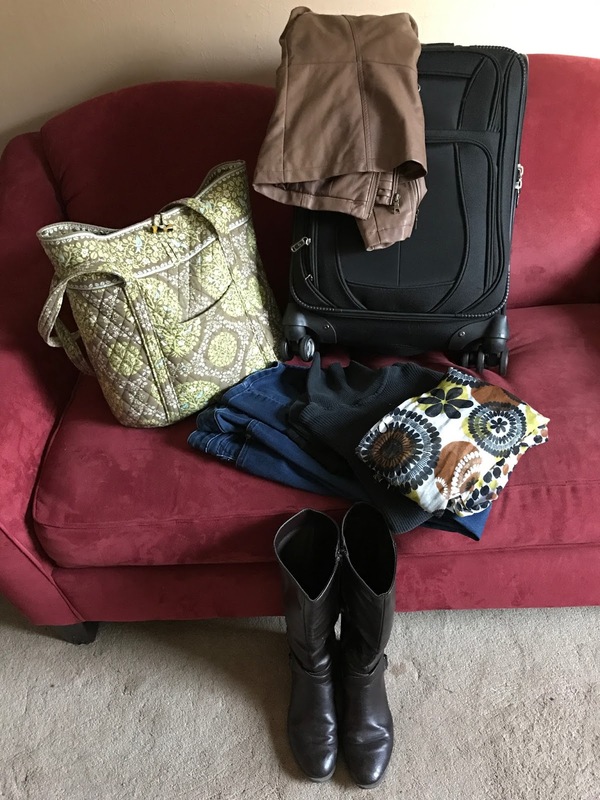 I typically over pack, but then I usually drive on trips and avoid flying. Never been overseas although took one trip to Ecuador. Don't know that I'll ever need this advice, but definitely something to remember just in case. This is so timely, Molly! I leave for a week in England next Wednesday. I devoured your article, and will use it to finish shopping and packing. 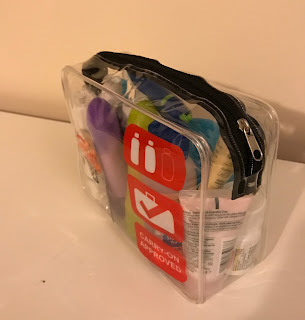 Where did you buy the TSA-approved toiletries bag? I love the idea of the packing cubes. Brilliant ! Have a great time – I can't wait to hear all about it!